"Oh come on, come on, we've all been looked at before..."
Every double feature needs a B-side, which has to be one of the main reasons House of the Damned exists. Armed with a killer title and a trailer that dared audiences to enter its potentially haunted doors, the film is an old school fright flick that probably felt like a throwback even when it was released. Overshadowed by another haunted house flick from the same year (The Haunting, which has gone on to become one of the most revered films of its type), this one continues to linger as 60s also-ran that producer/director Maury Dexter threw together to perhaps cash-in on some residual good-will from the likes of House on Haunted Hill. Scott and Nancy Campbell (Ron Foster and Merry Anders) get a call from Scott’s buddy (Richard Crane) about an abandoned castle that was once inhabited by a famous actress. He wants Scott to do some architecture work and survey the place, so he suggests that the Campbells spend some time there, which can also double as a romantic getaway. The couple agrees, and the house seems perfectly normal until a series of strange events begin to plague them: keys begin disappearing, doors open on their own, and weird visitors seem to skulk around in the night. I’d say that a movie carrying a title like House of the Damned had better be one killer house of horrors, but this is clearly a movie that looks to have been thrown together for the express purpose of inhabiting the lower end of a double bill. 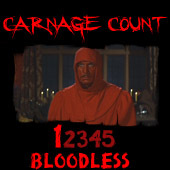 An obvious William Castle wannabe, its title promises a lot of intrigue to be sure. Its failure to deliver on its intrigue is what ultimately sinks it; though it tosses out a bunch of possibilities (for example, maybe that famous actress escaped her mental ward and has returned home), the big revelation is a bit underwhelming, especially considering that the sense of mystery is the only real thing driving the plot. The eventual resolution to the conflict provided by the titular damned (who don’t seem to be so much damned as pitiful) has to rank among the most non-violent and congenial in horror history. It’s almost as if the film checks its watch, sees that its reached the hour mark, and decides to slam its damned door. Before that point, though, House of the Damned is adequate. I especially enjoyed its moody black and white photography, which is obviously inspired by film noir. Some shots are expertly awash in stark contrasts that set the right tone, as our protagonists are about to possibly enter somewhere a bit otherworldly. And say what you want about its inhabitants, this house actually looks quite damned and foreboding. A haunted house movie without a nightmarish abode is an empty experience, particularly when it doesn’t have much else going for it. Also, the tenants terrorizing the Campbells are legitimately creepy before we learn the true nature of their identity. One of them sneaks into their room while performing a weird-looking spider-walk, which is rather startling. One of the freaks is essayed by Richard Kiel, who would go on to portray Bond villain Jaws, and he looks as weird as ever here. Really, many of the horrors offered by House of the Damned are like those in House on Haunted Hill in that both seem like the film equivalent of an old carnival attraction. In this film’s case, that description is actually more apt, as weird things pop up before you move on to the next. Before you know it, the ride’s over, and you just hope you didn’t pay too much. House of the Damned is a film that could have been improved by either cutting or adding thirty minutes. As it stands, it either feels like a bloated episode of The Twilight Zone or an undercooked feature film. It’s quite harmless and toothless, but kind of fun while it lasts, I guess. One wouldn’t expect a damned house to be so quaint, but that’ll be its enduring quality for me. From its folksy lead couple to its simple thrills, it really feels like a 50s movie out of place in the 60s, which were both growing more violent and more garish with their horrors. But I imagine it made for a fine B-movie experience, at least in the sense that many couples probably only saw half of it as they made out in the back row. We’ve got to settle for DVD these days, of course, and Fox released this one about five years ago; it’s a flipper disc, with the full screen version on one side, with widescreen on the other. Obviously, you’ll go with the latter, as the film utilizes glorious Cinemascope. The transfer is fine, as is the soundtrack, though you’ll get no extras for your troubles. A word of warning: don’t read the plot synopsis on the back cover, as it actually reveals the big twist, which will make an already average experience even more average. Damned, indeed. Rent it!